Knock yourself out with 100 high-flyin and punch-packin Kung-Fu films! This thrilling collection of jaw-droppin flicks brings together a colossal assortment of martial arts madness. From the ultimate Shaolin masters to the legends of Kung-Fu, theses cult classics are hard to find and sure to delight with high-kickin humor and adrenaline pumpin action! Overall the sound is just OK. It’s basically VHS to DVD and it varies between movies. Most of the The films fit in the 2 star range. A hand full would be lower and a Hand full of films will be a Tad Higher. As an average of all the films viewed it gets a 2 star. What comes with a 2 star film in audio is hiss, pops, degraded sound, not a full sound, 2 channel. With that said, its listenable and most importantly is that it doesn’t annoy me when viewing the film. Just like The Sound rating, films vary with some lower and higher than rating I give, but the average would be what I have given to the PQ. Most films are decent looking and watchable. VHS to DVD transfer, you will get some pixelation blurry faces in further distant shots, overly dark scenes, faded color and dust and scratches. Others things I have notice in some films that does annoy me is that the films are cropped side to side so I encountered about 3 scenes from all 50 films I have scene when I person is talking and isn’t on-screen but was supposed to be. Overall most of the films a watchable and doesn’t bother me, about 2 films from the 50 for me were worse and kind of unwatchable but the majority is good to view, not great, not Blu-Ray but the best a VHS to DVD can be. ……..Some films may not be VHS to DVD. Hello Reader! What We Have Here is a Failure to View EM All. Yes Yes! I’m doing a Review on this big O’l Box set with only half of the films looked. Why you say? Its Freaking 100 movies. 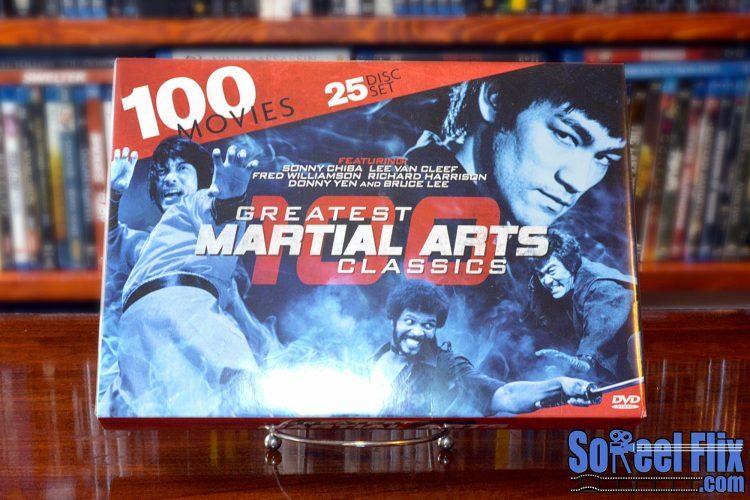 100 Greatest Martial Arts Classics is a Huge set of Mixed Film ranging from Fun watches to not so great, which for me was to be expected. As of Now with 50 films watched the rating for me is a little more that I thought it would be. Now Lets get it straight, The Tittle says Greatest and Classic but not really. Let me explain, No Shaw Brother Films, That’s All. But hey that can’t be helped, you need the rights to sell those films. Don’t let that make you turn your head to this Set, There are some classics though in a small amount and a majority in between and some that are just not good. Over all the box set is worth it due to the fact that I enjoyed Most films and only disliked a few. I still have 50 to go so I might find some more films I never seen before that I enjoy which is something I’m looking forward to. I wont tell you here in these paragraphs what I like and dislike, you can check below for the entire list of 100 films with 50 of them rated. I will over time rate the films and update this review. With 100 movies on 25 disc, 4 films per disc, the age of the film, the rarity of the film, the destruction or missing Original material all play a factor. All the films a ran across are not all that great in PQ and Sound. Most of the films do not have any original material to remaster so we can only get what is out their and that is VHS, Most of the films are VHS to DVD. Most ranging in the watchable to good-looking and some are just bad. Good thing so far is that no subtitles so you don’t have the hard to read texts….every things dubbed which is a plus. Only a select few of the films have a DVD release (I can count on one hand) and I do have a few of those. You can check the photos below for Comparison between the 2 versions to give you an overall expectation to what you are going to be getting. For the price I’m seeing now on Amazon at $22.99, the box set is worth buying and boosting you collection. It’s definitely worth having at that low price and you will find films you have never see before and enjoy them. The box set has tons of recognizable actors and you may have a few of the films all ready, I had 7 films from the box-set on DVD. I found a select few films I highly Enjoyed like stranger from Shaolin. My rating as of now is a 3 out of 5 for this box set due to the amount of movies I enjoyed. I wont take out for PQ due to that you really can’t remaster VHS to DVD masters and No Original Masters are around as most older films are destroyed. Martial art watcher/Collector…Pick it up and Find some rare gems. Photos: Comparison to My Stand Alone DVDs to The films in this Box Set. From The screen caps, The film from the box set fills the screen more but is cut on the right just by a fraction and not noticeable unless you lay the photos on top of each other. The film is also brighter which you lose some details in darker areas as you can see from the guys face, its blown out and the colors are more white loosing that flesh tone. From this screen cap, The Film from the Box set is less in quality due to the over brightness compared to the Stand alone. The stand alone has better color as in flesh tones, but the film from the box set fills the TV Screen more. Both films are crop differently. The Film from the box set is cropped side to side and the standalone DVD is cropped top and bottom. With this film there is a big difference in PQ, the stand alone is sharper and colors pop. The version from the box set is dull and if you look at the chicks hair you can barely notice that there is a red thing in it as you do see it in the stand alone version. Diffidently watch this film on the stand alone DVD as its wide-screen, colors pop and is sharper. I can tell a difference in the Sound of the films, the box set version is thinner sounding and on the stand alone its a deeper sound but a little muffled sounding. Also overlayed the two photos so you can tell the difference in how it will fill the TV screen the big difference in colors. Overall I would say if there is a standalone version of the film I would get that version over this Box set. Their are only a hand full of the films here in the box set that are sold separately. Picture Capture Method – DVD Screen Cap (computer) True Visual. Some Films have name changes, some films are incorrect as a mix up do to the same title were used for different films. I tried my best with the films I viewed and added to the Notes section below. Well Worth the price listed here.